Hatch contacts secure hatches and/or hatch covers. 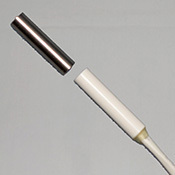 There are two parts to the wireless hatch contact: a transmitter and a magnet. The transmitter gets mounted on the hatch, and the magnet mounts on the hatch frame. The two parts need to touch when the hatch is closed. When the security system is armed and the hatch is opened, the alarm will trigger. 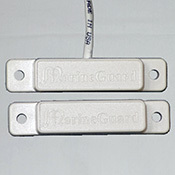 Accessory for MG01C and MG02C boat alarms. Contact Size: Transmitter is 2.75"L x 1.5"W x 0.5"H. The magnet is 2.5"L x 0.5"W x 0.5:H.
Small, flat contact for an open circuit. Includes 20 foot lead of 22/2 wire. Install on hatches and/or hatch covers. The contact is installed on the hatch door; the magnet is installed on the hatch frame. 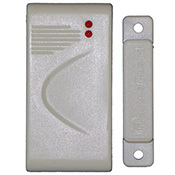 Accessory for MG01C and MG02C boat alarm systems. Contact is 1.0"L x 0.5"W x 0.25"H. Magnet has the same dimensions. 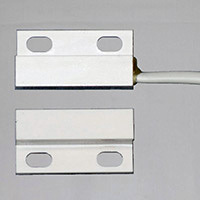 Large, flat contact for an open circuit. Contact is 2.5"L x 0.5"W x 0.5"H. Magnet has the same dimensions. Circular alarm contact for an open circuit. Install on hatches when you want the contact concealed. The contact is buried in the hatch door; the magnet is buried in the hatch frame. Contact is 1.0"L x 0.25"D. Magnet has the same dimensions.